The Environment Agency’s £100m Boston Barrier – which will better protect more than 14,000 properties from tidal flooding – has been given the green light by the Secretary of State for Environment, Food and Rural Affairs (Defra), Michael Gove, and HM Treasury. 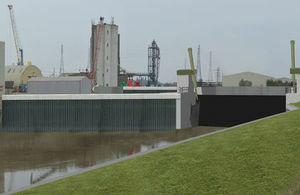 The tidal barrier will feature a moveable gate across the River Witham (also known locally as the Haven), together with a new control building to operate the barrier, new flood defence walls on both banks, and a replacement gate across the entrance to the existing Port of Boston wet dock. The Barrier will make Boston one of the best protected areas from flooding outside of London. The Secretary of State has now approved the Transport and Works Act Order (TWAO) to grant powers to construct and operate the barrier, and work is set to begin in January. The Boston Barrier scheme is an inspiring example of collaborative work between the Environment Agency, councils, businesses and the local community. I am pleased that it will help to protect more than 14,000 homes and businesses from the kind of flooding the town experienced in December 2013. I look forward to the finished scheme. Following approval for the scheme’s full business case from HM Treasury last week, the contract for the project has been awarded to Bam Nuttall and Mott MacDonald joint venture (BMMJV). We are looking forward to delivering this innovative flood protection scheme. We have a proven track record of success having recently completed phase one of the Leeds Flood Alleviation Scheme. Boston has a long history of tidal flooding. The town flooded in 1953, again in 1978, and more recently during the tidal surge on 5 December 2013 when defences were over-topped, damaged or breached. This affected the town extensively, with more than 800 properties flooded across 55 streets. The Environment Agency is investing £2.5 billion across the country, which will see 1,500 flood defences reducing risk to 300,000 homes by 2021. Everyone has a responsibility to take measures to protect themselves from flooding, such as knowing your risk, signing up for the Environment Agency’s free flood warnings, and making a flood plan so you’re prepared in advance. Call Floodline on 0345 988 1188 or visit www.gov.uk/flood for more information.